We discover the water node and confront the new would-be leader of the Cult of the Crushing Wave. It’s boss battle time! I got lucky with the timing and received a whole week between sessions to prep for the confrontation at the water node. “Princes of the Apocalypse” has a lot of neat “if the PCs do this, then change this” situations. Mostly they have to do with the free-form order in which the PCs can tackle the four elemental cults. If the Cult of the Crushing Wave’s prophet was previously defeated, then one of the big monsters in the final water dungeon, an aboleth, attempts to gain control of the cult. 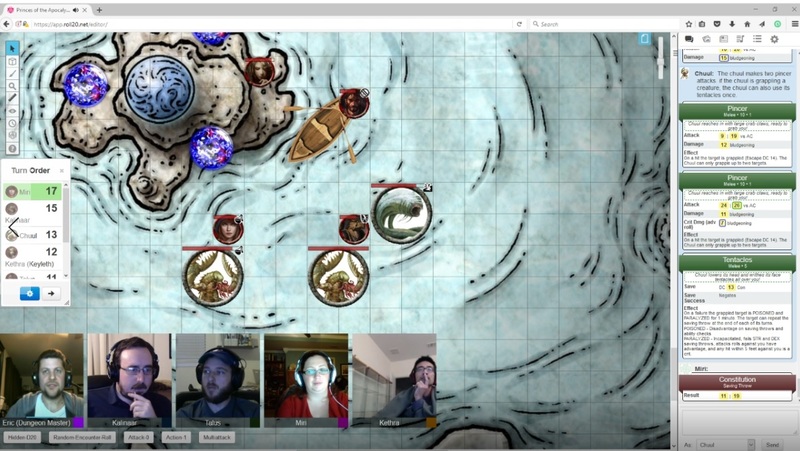 I had to tease the creature through a bunch of cultists since my party unfortunately skipped the entire Western section of the Plunging Torrents, which features the worshiping Kuo-Toa and the aboleth’s lair. I have a lot of fun role-playing monstrous creatures. 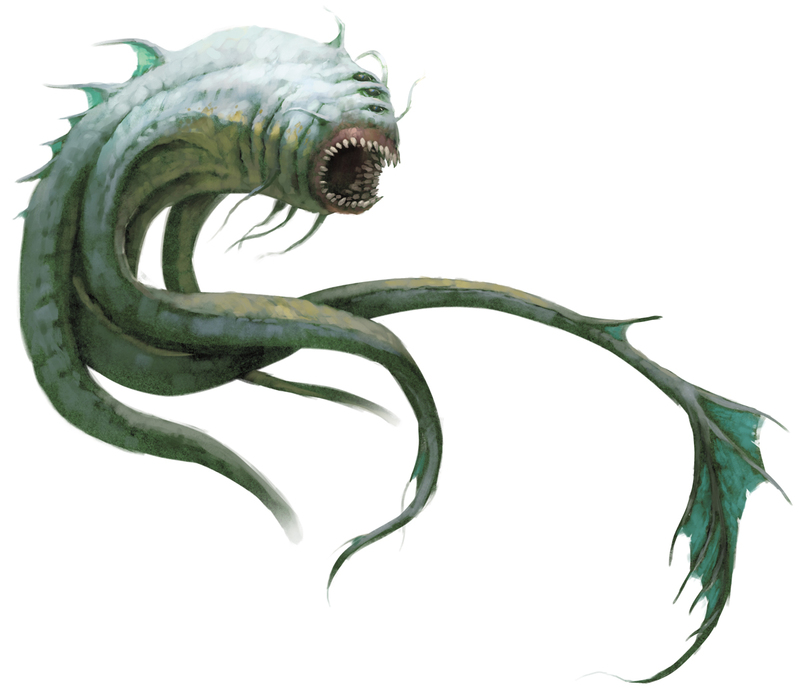 The aboleth, named Yngukulub (whom my players affectionately referred to as Young Giggle Cub) provided a fun chance to dig into my players’ heads, tempting their characters with their deepest desires. I had the PCs roll to resist the tempting effects of its mind probe, using the Short-Term Madness table in the Dungeon Master’s Guide. Talus succumbed to its effects, falling stunned on the boat. Kalinaar and Miri were both dragged underwater by a pair of Chuuls, while I attempted to Enslave the party with the aboleth. Unfortunately D&D’s suffocation rules aren’t terribly exciting in the heat of combat. Since combat takes mere seconds per round, it’s pretty damn impossible to drown someone in the middle of a fight. Kalinaar and Miri didn’t even try to wiggle free, instead content on poking the lobster-creatures. Meanwhile I rolled laughably bad for the Aboleth’s attacks. I did enjoy that the party had to use both Inspiration and a Divination Die to prevent Kethra’s enslavement, but otherwise the battle wasn’t quite as epic as I’d hoped. Without enslaving anyone the aboleth is pretty much limited to its tentacle and tail attacks. Even its disease aura was rendered moot by Kalinaar’s Paladin immunity. Partly it was because the party was still in really good shape from their Long Rest and had fought the easiest path to the node. With the enemies slain, they had to briefly debate on how best to actually close the portal. I had some more fun with role-playing Olhydra in the Plane of Water beyond, and seeing flashes of Gar’s life through the trident Drown. In the end Kalinaar hurled the trident into the portal, destroying it and the portal in the process. The first of the elemental nodes has been sealed, and the water cult’s power has been dismantled. Given the straight shot and the unfortunate “any three path leads to the node” dungeon design, my players completed the Plunging Torrents far quicker than I anticipated. With Miri’s hold on the air weapon Windvane cause for concern, the party opted to return to the Black Geode next, where they’d previously fought their way through almost to the node. As we hit our one-year anniversary we may be finishing up this campaign fairly soon. The party is slaughtering their way through these final areas, despite actually being a few levels lower than suggested in the campaign book. It helps if you skip large chunks of the dungeon! Next week – the earth node!